– 14 sell points – including BGA, Hayloft and manual milk selling. – 2 train sell points. – Did you like square fields friendly for AI worker or field that have tier own specific shape? On this map can be found both of them for everoyne. – Lot of models made by myself, also contains models from other autors. – Forestry and missions all included. – Map Supports Seasons mod. Kotte Universal Pack – for Farming Simulator 2017, which can be found on the internet. 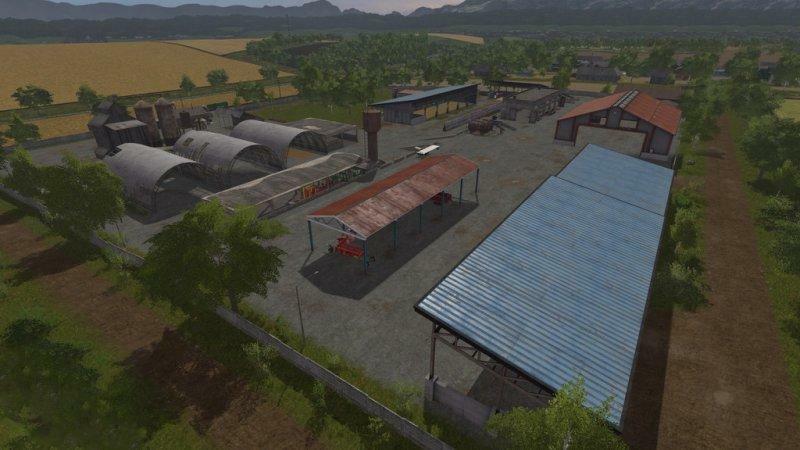 – Added lot of mCompanyFactory buyable objects, where you can produce various products (Dairy, Meat factory, Soymilk production, Orchard, Greenhouses, Sawmill, Pallet fabrication, Quarry, Concrete plant and various small machines to produce: pig food, manure, fertilizer and seeds. – With mCompanyFactory objects, added a lot of various new products, pallets and fillables. – Added animated objects – vehicles, persons and animals which brings more life to map. – Changed functionallity of milk selling. It have to be sold manually (see description above) or used to produce milk products for better proffit. – Added icons of mCompanyFactory businesses and other objects on pda. – Added new sell points for new products. – Fixed and improved animal pastures. (a cow is no longer getting stuck in corner of stable if eating). – Better optimalization. Thanks to clipDistanceControl script, vehciles parked in garages on farm are not rendered on same distance as those in open areas so if you have lot of vehicles on farm your game should run better if close to main farm. Some changes in render distance has been made too for various objects on the map. I have done a lot of work with texture replacements for roads, sidewalks, rails… There are snowy textures for those so the winter now looks mutch better. Unfortunately it is not possible to replace terrain textures(painted ones in editor) I will make an udate for this as soon as the Seasons mod creators make this possible. – Your farming equipment can now be customised in the vehicle workshop shed at the farm. – Fixed rotation position for amazone sprayer in default vehicles, now can be attached to vehicle without any issues or necessity of resetting it. – Fixed some little objects on the map, that was not placed correctly. – Eggs now appears only in henhouse. – Fixed golden nuggets, that was not able to collect. – Fixed Maplefield Mill icon on minimap when fully zoomed out. Some other icons are now positioned correctly, where they should be. – Flipped positions on water and food troughs (sheeps and pigs pasture) for better access. – Added gate on the east side of the farm.